Visitors, whether on bikes or in their cars, enjoy travelling in the locality because the scenery is so stunning, and the roads are relatively quiet. 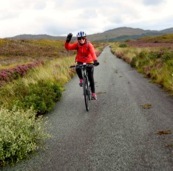 The roads around the West Highlands are rarely flat or straight, so are both challenging and interesting for cyclists. The main roads tend to be quite narrow and can be busy, especially in the summer…….but get off the main highway and some beautiful road rides are available. 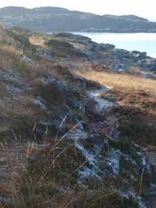 Many sections of the roads in the Balmacara estate, in which Drumbuie is situated, have recently been re-surfaced but almost all the roads are single track with passing places. On these idyllic single track roads, bikers have to remain vigilant. 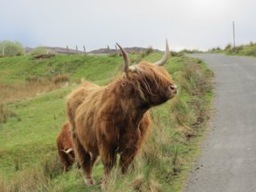 As well as local folk going about their everyday business, other road users include sheep and Highland cattle! 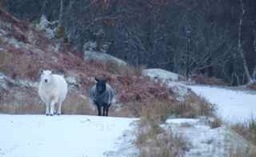 Deer are also a collision risk and their behaviour can be particularly unpredictable. 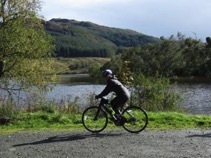 Local routes are included in 'Bike Scotland's 40 Classic Highlands and Islands Routes'. The short loop from Drumbuie around Loch Lundie is also popular. For the most energetic road cyclists, those who are after bigger challenges, great biking loops are ideally attempted from Nanyuki. These might include the Mam Ratagan Pass, with its long climb and superb long roll down to Glenelg, nice break on the Kylerhea Ferry to Skye (Easter to mid-October), then a second long climb out of the glen and back to Drumbuie via the Skye bridge. 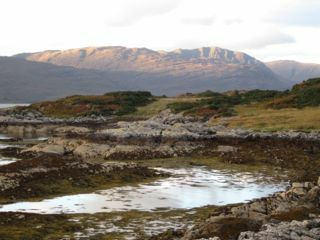 The Bealach na Ba, one of the most spectacular road passes in the UK, is just visible from Drumbuie. Nevertheless it is 25 miles by road from the village just to the bottom of the pass. (Here is where your local friend with the bike transport comes in handy as the approach route around Loch Carron may not be particularly bike friendly!) The classic loop from the head of Loch Kishorn, over the Bealach to Applecross, then round the coast to Shieldaig and back to the foot of the pass is 69 km/43 miles and hard enough for most riders. Various descriptions and perspectives have been collected together below to give you an idea of what you might find. Click here for more information and perspectives on the Bealach na Ba. 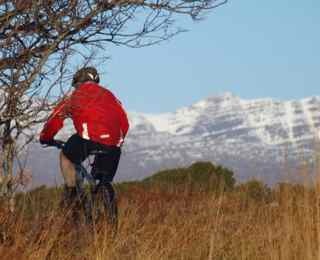 The local area around Drumbuie offers great cycling directly from the village. Plenty challenging off-road biking on local tracks and trails can be had without resorting to a car. A specifically designed mountain bike course just over the Isle of Skye bridge is within very easy reach and provides an ideal taster challenge. The terrain here is steep, so a reasonable level of fitness is required to enjoy sustained off-road riding. There may not always be the option of avoiding the tougher sections. Riders need to be prepared to sweat a bit up the hills to gain the rewards of spectacular views and the exhilarating downhill single track.